Electric skillets give you the ability to cook food on a surface with an even, consistent temperature. 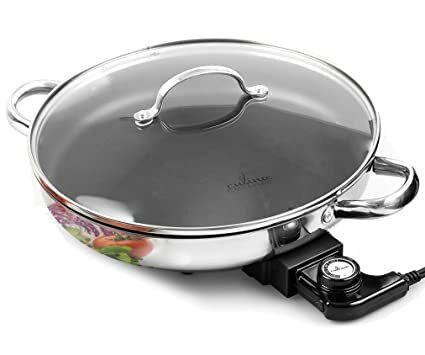 Making pancakes, grilled cheese sandwiches, and hash browns can be much easier when you have the right cookware.The benefits of this common piece of cookware range from convenience to making extra space on your stove top. Finding a good electric skillet means looking for quality materials combined with good heating. With these two characteristics, you will be able to cook consistently every time you pull it out of the cupboard. The Culina 18/10 Stainless Steel Nonstick Interior Electric Skillet (Culina) has the features that you need with the quality that you want. Nonstick cookware has come under close scrutiny in the last few years as science has learned more about the effects of the nonstick coating on the human body when it is ingested. Nobody wants to have built up toxins in themselves or their family members. To prevent this, the Culina uses the Whitford Eclipse nonstick coating, which is PTFE/PFOA free making it safer than traditional nonstick surfaces. The Whitford Eclipse nonstick coating uses a three step system to create the nonstick surface and eliminate flaking into food. It uses a primer coat of hard materials that withstand the bumps, scrapes, and scratches of normal cooking. The mid-coat uses special reinforcing elements to harden the coat even more. The final coat has fluoropolymers that create the ‘release’ effect of the coating. This safer version of a nonstick coating can work well and doesn’t release harmful chemicals into the food. As part Whitford’s testing of this coating, they perform a scrub test to be sure the coating can withstand heavy use. Dried on eggs and other debris left over from cooking can take a firm scrubbing to get out of a skillet. Not only does this take a long time to clean but it also can, potentially, damage the cooking surface. With the Culina, the nonstick surface is good enough that cleaning it is fast and easy. All parts of the Culina, except for the temperature control, are submersible and dishwasher safe making cleaning that much easier. The Culina has a good temperature range of 225 – 425 degrees. Most cooking can be done in this temperature range. One of the benefits of an electric skillet is its ability to hold a consistent, even temperature. The Culina does the job and it does it well. An indicator light lets you know when the cooking surface has reached the chosen temperature so you don’t have to guess when the skillet is ready for cooking. The heating element bends at a 90-degree angle outside the pan to help reach the most convenient electrical outlet. It glides into the pan smoothly and creates a tight fit so that it won’t slip out during use. It also heats the skillet quickly so you don’t have to wait long to start cooking. A mirrored stainless steel finish creates an elegant look for the skillet. This finish also gives this cookware a professional appearance. Even if you aren’t a professional chef, you are going to enjoy the look and feel the Culina offers you. Durable cookware can be hard to come by. The Culina provides the durability that you want with high quality 18/10 stainless steel. This means that the skillet is 18% chromium and 10% nickel, the rest is a combination of iron and carbon. While 18/10 is considered a mid-grade stainless steel, it is highly resistant to corrosion and has good strength for cookware. Riveted cool touch handles on either side of the skillet will hold and provide a good grip when you need to move it. These cool-touch handles not only have a tight hold of the skillet but they also stay cooler than the cooking surface so that you don’t burn your hands when moving it. During cooking, you frequently need to move the contents of the skillet around to get even cooking of the food. Some skillets can move around your countertop, posing a risk of falling off of or running into other items on the counter. To prevent moving while cooking, four thermoplastic feet are attached to the bottom of the skillet. They hold it in place so that you can turn, flip, and move food as needed. A domed see-through lid lets you watch the food while it cooks. This helps you keep an eye on your cooking while you go about other tasks in the kitchen. You’ll be able to see the stage of cooking your food is in without lifting the lid and releasing heat. The Cuisinart CSK-150 1500-Watt Nonstick Oval Electric Skillet (Cuisinart) has a large cooking surface and heats up quickly to give a fast easy way to prepare meals. Designed with a crowd in mind, the Cuisinart has a large 12-inch x 15-inch nonstick cooking surface. This gives you more room to prepare larger dishes. Large families or people that often cook for a large crowd. With 2.5-inch sides, you can prepare a roast and potatoes in this skillet that can hold a steady temperature better than a traditional oven. You can load it with a lot of food and it won’t fall out. The skillet holds the heat in and evenly cooks food. The nonstick surface makes cleaning the Cuisinart simple and easy. You won’t end up with cooked eggs, charred meat, or other food stuck on your skillet. Sometimes cleaning the food out of cookware can take longer than cooking the food itself. Not only is the Cuisinart easy to hand wash, it is dishwasher safe except for the temperature control unit. The Cuisinart can hold temperatures from warm up to 450 degrees. With a temperature indicator light, you will always know when the skillet is ready to cook, taking the guesswork out of preparing your food. A glass see-through lid makes keeping an eye on your food convenient and easy. When you have to lift the lid off of a skillet to check the food, you let out heat and can slow down the cooking process. Clear lids give you an advantage of knowing the cooking stage your food is in while maintaining the temperature within the skillet. Large stainless steel handles on either side of the Cuisinart are strong and well placed, making it simple to carry or move if needed. The color of the handles blends seamlessly with the rest of the skillet for a sleek looking addition to the kitchen. Because the handles are made of stainless steel, they will conduct heat which will cause them to get hot. It would be best to only pick up the skillet with hot pads or oven mitts on to prevent burning your hands. The exterior of the Cuisinart is made of brushed stainless steel. This gives it an industrial look but with all the exterior, except for the lid, made of this same material it also maintains a sleek and professional appearance. It is a piece of cookware that looks good sitting on your counter. To prevent the skillet from moving across the counter while your stir or flip food, four feet non-skid feet on the bottom hold it in place. Skillets that move while you cook are not only dangerous but can make cooking your food difficult. A nice added feature of the Cuisinart is the included instruction and recipe book. It includes 30 recipes for you try, each helping you learn the ins and outs of a new skillet. The Cuisinart comes with a three-year limited warranty. The Oster CKSTSKFM-1216R 12-Inch by 16-Inch Electric Skillet (Oster) is large and has good basic features to make cooking simple and easy. The Oster has a large nonstick cooking surface. Large families or those that entertain often will be able to make enough food to feed a crowd. Raised sides on the Oster also allow you to put more food in at on time. A skillet of this size allows you to create an entire meal in one pan. One pan cooking will save you time in the kitchen, not to mention time cleaning dishes. A nonstick cooking surface helps you get the most out of your meals and makes cleaning easier. When cooking eggs, you aren’t going to lose eggs that stick to the side of the skillet. You’ll be getting the amount of food out that you put in. All components of the Oster, except the temperature control unit, can be placed in the dishwasher for fast easy cleaning. Traditional electric skillets could not be submerged in water, but the Oster can handle the water and won’t cause you any extra clean up. The Oster also comes with an adjustable, removable temperature control unit. Once the temperature is set, the Oster quickly warms and holds the temperature. However, some users found that the temperature varied by location in the skillet. Since consistent cooking temperature helps you to get the best results, if you find problems with uneven heating, contact Oster directly. When washing the skillet, the temperature control unit should be removed. Plastic, cool touch handles allow you to hold and move the skillet when needed. While the handles do not get as warm as the rest of the skillet, they have been known to come off. Oster has promptly responded to all customer complaints about this issue. If you are looking for a skillet that will complement your color scheme or provide a pop or color on the dinner table, the Oster can do it with its red color. Colored cookware can give your meal presentation some personality and fun. A clear lid lets you see your food while it cooks. You’ll be able to track the food’s progress to, hopefully, prevent over or undercooking the food. Being able to see the food will also prevent you from having to lift the lid to check on it and, consequently, letting out the heat which will slow down the cooking of your food. The Oster is designed for the best efficiency and heat transference with the lid on. Some users that frequently cooked without the lid had difficulties with cooking time and getting even cooked. The Oster has had some problems with the heating element. Some users have had trouble with the element shutting off part way through cooking while others have reported that it began to glow red. If you experience any problems contact Oster directly as they respond to customer inquiries in a timely manner. The Nesco ES-08 Electric Skillet (Nesco) is an 8-inch skillet that gives you good results at a low price. The biggest different between the Nesco and other more pricey skillets is the size. At only 8 inches, the Nesco doesn’t give you a lot of surface area but the cooking area it does provide works well. Eight inches is enough to let you cook side dishes or a small entrée. You can also use it to cook a small roast without vegetables. A nonstick interior makes cooking and cleaning in the Nesco easy and simple. You won’t have to scrub hard to remove eggs or other foods that commonly leave a lot of residue. With a nonstick interior, be careful when cleaning. Metal cooking utensils have been known to scratch nonstick surfaces, causing them to chip into your food. While you don’t need to treat the Nesco delicately, keep in mind the best practices when using nonstick cookware. A clear lid with a cool-touch handle lets you keep an eye on your food while it cooks. As you cook, you’ll be able to see when your food is ready to be stirred, turned, and removed from the skillet. The lid also has a steam vent to release any built up pressure. Steam vents are a nice feature because they let you keep the lid on in most cooking situations. Releasing steam helps to prevent the lid from moving around on the skillet and food from boiling over while cooking. Both the skillet and the lid are dishwasher safe, making clean up even easier. The Nesco’s nonstick surface will already make rinsing the cooking surface quick and easy. Because you are able to place the Nesco in the dishwasher, you’ll save yourself the time and trouble of washing and drying the skillet as well. A removable, easy to read temperature control unit comes with the Nesco. The cord is angled at 90 degrees which helps it to reach to the closest outlet with ease. The temperature control unit fits snuggly into the skillet so there is no room for wiggling or falling out during use. Temperature control unit helps to heat the Nesco quickly. Once it reaches temperature it holds that temperature well. The Nesco is the perfect skillet for someone that cooks for 1 -2 people or as a secondary piece to handle side dishes for a large family. Many users also like to use it camping because it doesn’t take up much room in a mess kit. It is reliable and small enough that it won’t take up much room in your cupboard or on the counter. Having a skillet of this size is also useful in the case of a power outage. Size plays an important factor in the price of the skillet. In general, larger skillets are going to cost more money. Before you purchase you need to ask yourself how many people you usually cook for and what kind of meals you are hoping to prepare in the skillet. Finding the right size can also affect your cooking success as a skillet that is too big may over cook or dry out food. While one that is too small may overflow. 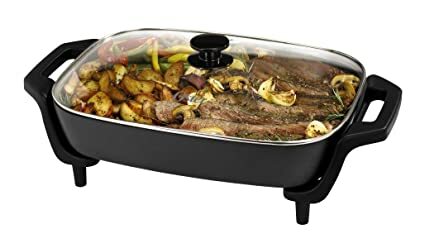 If you frequently cook for many people and you want a piece of cookware to cook your meat and vegetables together, you are going to want a large skillet with high sides. The high sides will give you the extra depth you need to layer more food. A 12 -nch x 16-inch skillet or larger will give you the surface area you need to cook for a crowd. For those looking to cook side dishes or to act as a secondary skillet, you may want to consider a smaller model. A 12-inch round electric skillet will still give you a good sized surface area but will not take up as much room. An even smaller square 8-inch model works well for one or two people. This small size is also ideal for cooking side dishes such as steamed vegetables or hash browns. Cleaning electric skillets used to be a chore that deterred many from using them. But today, with good nonstick coating technology, cleaning an electric skillet has never been easier. Look for a nonstick surface made with high-quality coatings. Nonstick coatings that chip off into food can cause toxins to enter your food and, consequently, your body. Most of the nonstick coatings used today can be safely placed in the dishwasher. They are easy to rinse and the only part of the skillet that cannot be submerged or placed in the dishwasher is the temperature control unit. Be sure to use the best cleaning practices with a nonstick surface. Metal utensils can scratch and damage the surface if you are not careful. The lid of an electric skillet can make cooking easier. Clear lids that allow you to watch the food while it cooks will give you the greatest control over your cooking. You will be able to tell what stage the food is in without lifting the lid off. With some dishes, it is important to leave the lid on as much as possible while cooking. This will help keep a consistent cooking temperature. The lid should fit tightly so as to trap the most heat inside for better cooking. Any lid that has a tight seal should also have a steam vent to let out extra pressure. Without a steam vent, you many need to tilt the lid on its side in the skillet to prevent food from boiling over or bouncing on the skillet. Consistent, even heating is essential to good cooking. Any skillet that you consider should heat quickly and distribute the heat evenly throughout the cooking surface. It should also be able to hold that temperature. The best way to check this feature is to read reviews and customer comments. If there is a problem with the heating element, it will most certainly show up and should serve as a strong indicator of the quality of the skillet. A good electric skillet can become an invaluable tool in your kitchen. They can not only become essential to everyday cooking but can also be used during emergencies such as a power outage as they work well when plugged into a generator. They are also convenient to use when camping as you can do almost all of your cooking in them. Examine your cooking style and the size of skillet you need before you purchase. Once you’ve decided on the size, consistent and even heating should be at the top of your list. These will help you find a skillet that will give you the results that you want.